How Much Will Social Media Really Affect the U.S. Election? 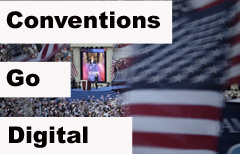 Is social media an election game changer -- the way television changed the debates between Nixon and Kennedy? That much remains to be seen. Social media is telling us a lot about the election. With some 4 million tweets during the Republican convention and more than 3 million from the first night of the DNC alone, there’s no doubt there’s a lot of noise. I propose that there is a middle ground, but that means finding a method to setting parameters around social media monitoring to produce tangible insights." A better question remains: Does that tell us anything useful? Reporting on social media monitoring metrics seems to fall somewhere between too much, like the prolific Twitter volumes above — and too little — like the individual post shown at right. The question that comes with volume is — so what? And these individual posts are often interesting, they provide color, but are they telling us much about the election momentum? I propose that there is a middle ground, but that means finding a method to setting parameters around social media monitoring to produce tangible insights. Is social media an election game changer — the way television changed the debates between Nixon and Kennedy? That much remains to be seen, but it is another viable source of data that provides indications, and the observations should be keenly considered in conjunction with traditional polling data and focus groups. Parameters, with careful diligence in comparing like-samples to like-samples can produce interesting results and help us identify trends. We can spot trends like shifts in momentum, such as the momentum that comes with each party’s convention. We can also see how the conversation centered on the Republican convention was fading even as the Democratic convention began to set the stage. While it’s still early, based on the data displayed here, it’s easy to predict the social volume will easily surpass the Republican convention’s social mentions. But still, the question remains: What does that tell us? 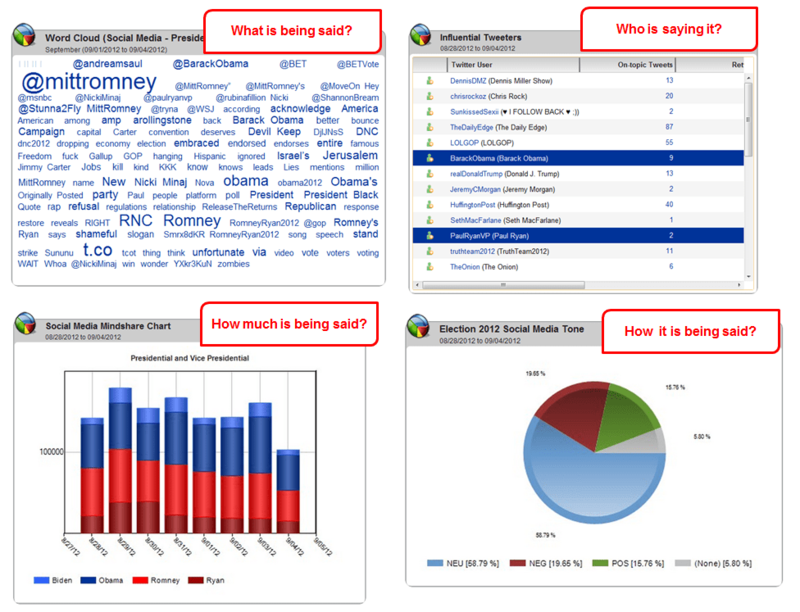 We’ve placed parameters on the social monitoring of the election — seeking out only the posts that reference by name, hashtag, or Twitter handle the presidential and vice presidential candidates. 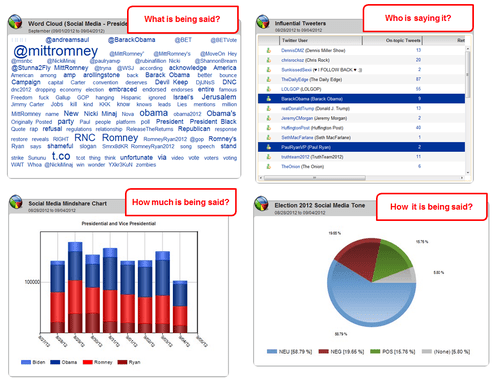 For example, we’re monitoring for mentions of “Barack” because the president’s first name is fairly unique and there’s a reasonable assumption that the vast majority of social posts referencing Barack will be in relation to the election. However, we are not monitoring for “Joe,” the vice president’s first name given how common the name is in this country. All in all, we are looking at seven of the most common search terms for both President Obama and Gov. Romney on social media. It’s an apples-to-apples comparison — with the intent of deriving insight. Likewise, we are monitoring four common search terms for Vice President Biden and Congressman Ryan. How much is being said? How is it being said? What’s interesting here is that both the Republican and Democratic tickets are virtually tied in terms of overall mentions, which reflects current polling. As of the middle of this week, Obama’s name accounts for about 38 percent of the mentions, Romney for 35 percent, Ryan at 17 percent and Biden for 9 percent — for a total, including a rounding error, of 52 percent of mentions belonging to the Republican ticket and 47 percent belonging to the Democratic ticket. This represents a slight shift, on the heels of the Republican convention, from the key issues of the previous week, though taxes overall remain by far the most discussed issue. The drivers? The Democratic ticket assails Romney for his personal income tax rate and planned tax policy, while Team Romney counters with similar messages (think: tax and spend) tailored to persuade voters to their views. Campaign issues of a financial nature, including “budget,” “economy” and “debt” have all ticked up following the Republican convention, as the national debt approached and eventually surpassed the $16 trillion mark. This chart is not just telling us volume, but it’s also telling us tone, where +1 is perfectly positive in tone, and -1 is perfectly negative. This chart is astonishingly reflective of what each side is making a key issue in the campaign. More importantly, it’s a chance for each campaign to see how their message on these issues is resonating online. Health care, for example, is toned mostly positive, and the deduction it’s given is a signature of the president’s term in office; it’s an issue for the Obama camp to reinforce and for the Romney camp to avoid (at least online). A similar deduction can be made for the debt; it’s certainly not an issue that Team Obama can hold up as an exhibit, and it’s one his opponent is rightly making an issue. In the 2008 election, Twitter was but a fledgling, and Facebook had a mere 100 million users. Today, four years later, Twitter is on track to reach a quarter of a billion users by the end of 2012, and Facebook is approaching 1 billion users. Social media is seemingly ubiquitous, and one of the often-overlooked aspects of the social web is the speed and ease at which people can share their views. 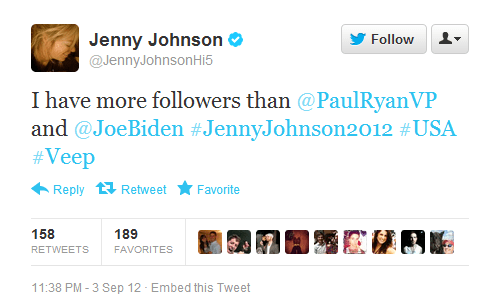 This leaves us to wonder — is the election of 2012 the first real social media election? 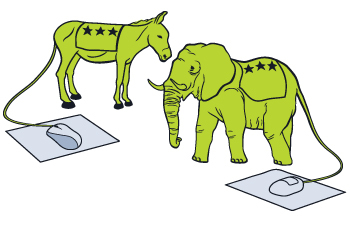 Are the voices and status updates a reflection of public opinion or simply a re-shared viewpoint in an echo chamber? Finally, and most importantly, given how closely social mentions track to the polls, can social media, finally, predict the election? We hope to find out. Frank Strong is the director of PR for Vocus and is using Vocus social media monitoring software to monitor the election. Regular updates are posted to the Vocus blog.